Traveling 25 mph down a dirt road east of highway 24, searching for the campsite near the entrance of the West Fork of Blue John Canyon. Jeremy and I pull over to gain our bearings and figure out just where exactly we are. While my navigator reads over the guide-book, and checks the map once more, I jump out to snap a sunset shot of the desert. We continue blindly down the unmarked road hoping to see a marker, trail sign or anything telling us we are heading the right way. We reach what we can only guess is the correct campsite, with nothing but a marker stating 1147. Set up camp with the head lights, and head lamps and pound a few beers. Completely exhausted by the long drive down from SLC, leaving directly after work. We decide to crash and get an early start to make an attempt at beating the heat. Awaking at first light, (truth is, neither of us really slept that well). Maybe it was our excitement, or the warm desert air in June..? We were able to get a better view of our location, and scanning the landscape we both agreed we were camped right next to the SandPipes. We begin out descent into the wash that leads down to the West Fork of Blue John Canyon. This is the route made famous by Aron Ralston when he got his hand pinned by a large choke stone and had to cut it off in order to free himself. We traveled down the sandy wash, hoping we were actually on the right trail. 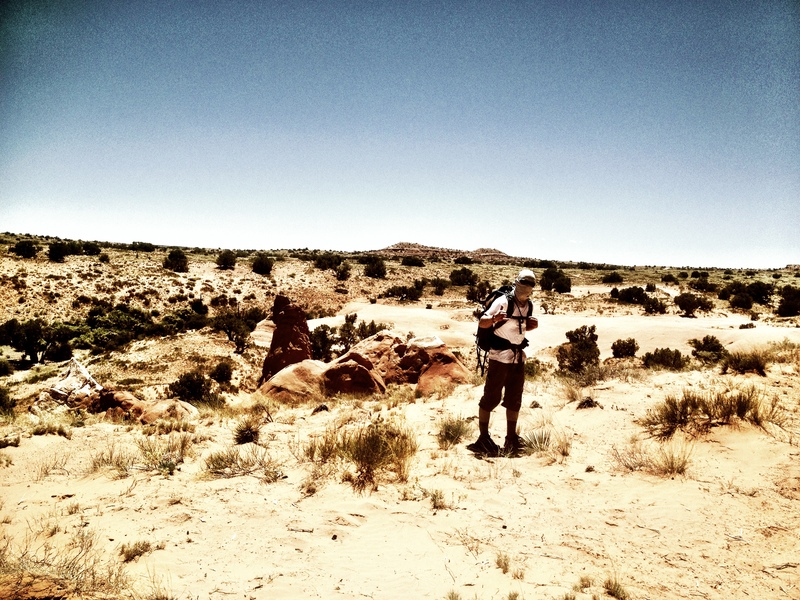 As there are no trail markers, your pretty much at the mercy of the guide-book. And your own navigation skills. But that’s why they call it an adventure right..? As I don’t feel we ever put ourselves in any unnecessary danger, there have been times where we did have to stop and question our abilities and knowledge before proceeding. 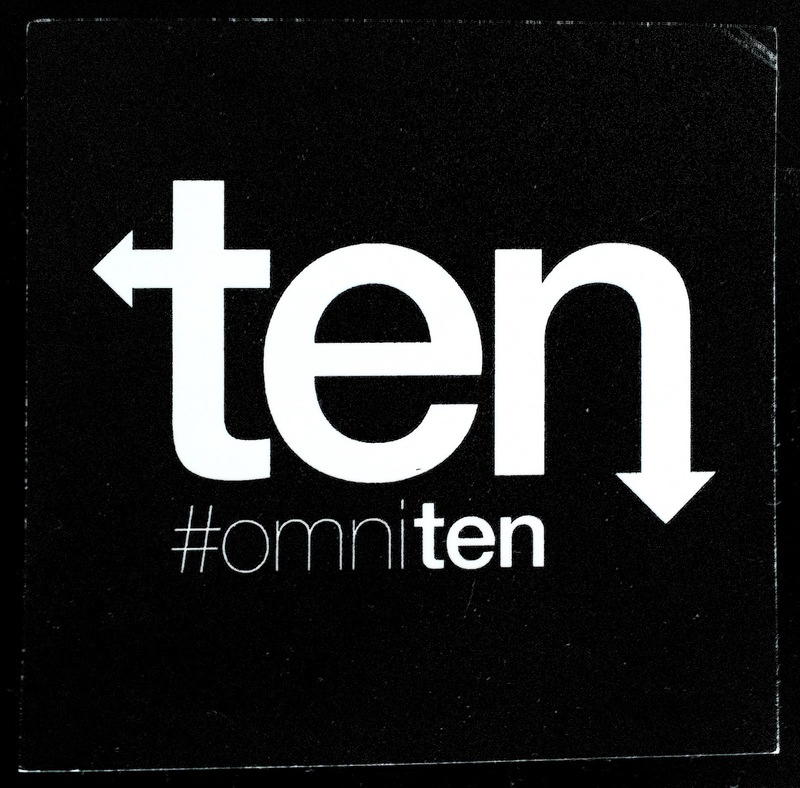 And the best rule of thumb in our group is “if EVERYONE is not in agreement, we don’t continue”. It’s not only about having everyone in the group feel comfortable, but also making a sound decision and informed. Sometimes one member of the group might see something others don’t. Anyways, we figured we couldn’t get lost so long as we stayed in the wash. I could tell Jeremy was a little bit nervous. Asking him if everything was ok, he replied “he had never rappel led before.” I was shocked and surprised, with all the years of climbing, he had never lowered himself off in a rappel. So I double checked his harness, showed him how to hook up the rap and instilled in him that everything would be ok. The dude did great, minus one small slip where he smacked the rock. More comical than dangerous… I immediately followed and once at the bottom, We thought how the hell are going to get back out if here..? Worse case scenario, I would solo the 30′ wall and set up a top belay. Luckily, we found the actual exit route about 30′ down the slot, it was an easy traverse climb back out. We continued down the West Fork until it joined in with the Main Fork. Convinced now we were on the right route, our excitement overloaded. We had a steady pace, and had reached the mouth of little Blue John in no time. As the only hikers in the canyon, it was peaceful. Once again, we had a 15′ drop to navigate down. 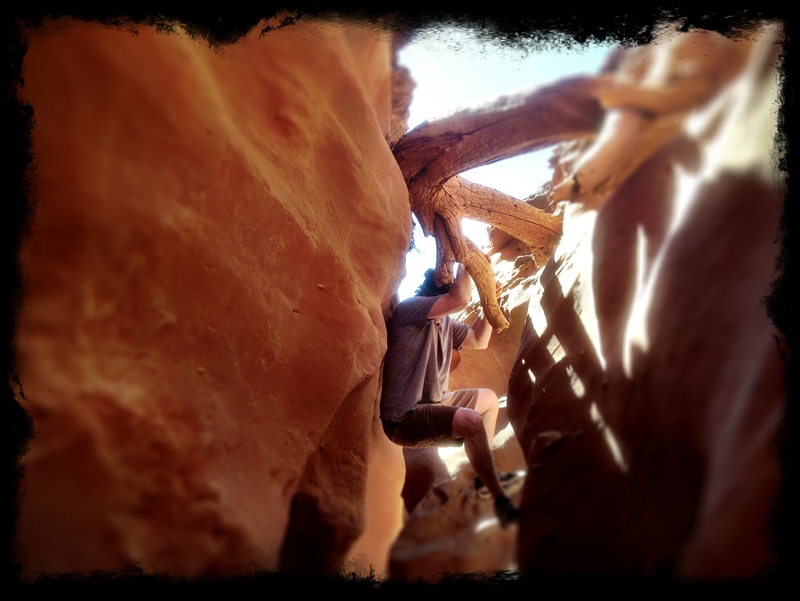 Scaling out the to the infamous “S” log scene in 127 hours. We monkey barred down off of it. Using a serious of stems, the down climb was easy. A little less than 100 meter I to the canyon, Jeremy proclaimed, “I think this is the chokestone Ralston got his arm pinned by”. I wasn’t convinced, but it turns out he was right… There’s a first time for everything. 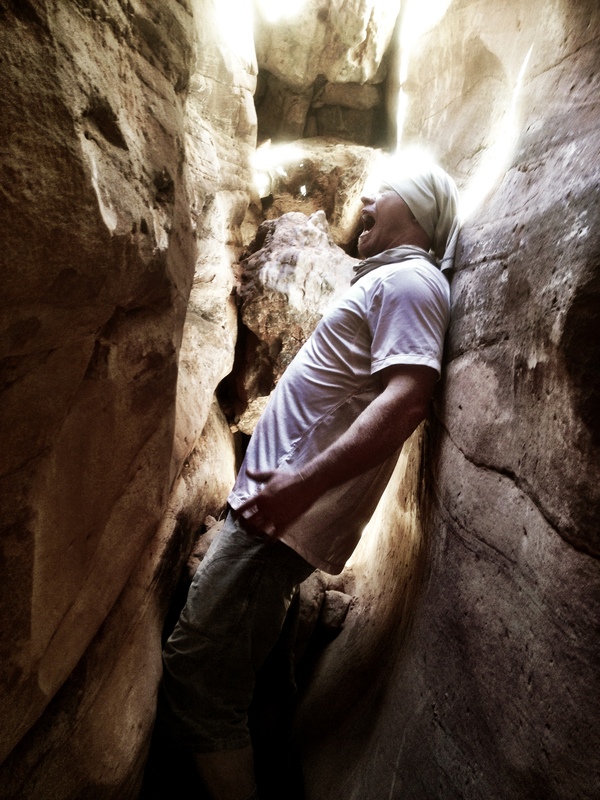 The slot canyon is about 2 & 1/2 feet wide. 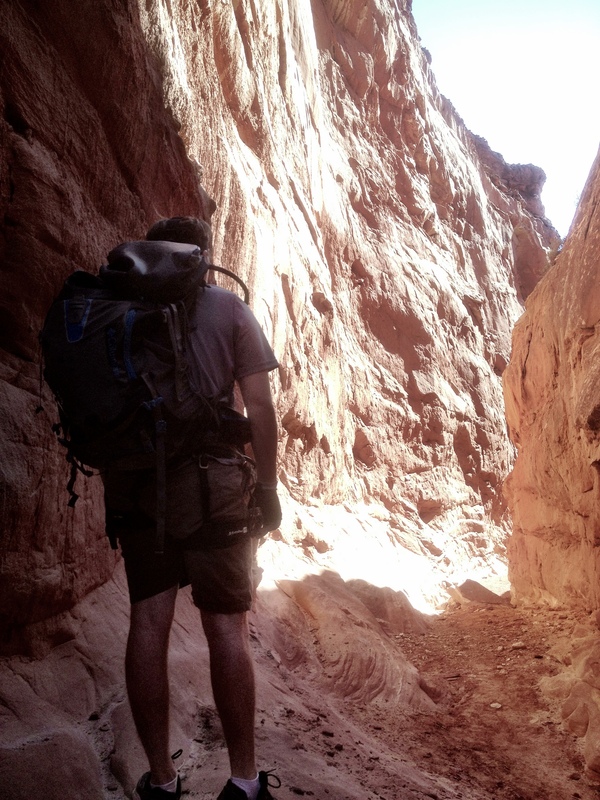 In many parts, we had to remove our packs in order to squeeze through and scale down each drop. I am amazingly impressed how Aron Ralston was able to navigate this with only one arm, after 5 days of anguish and starvation/dehydration. The canyon was only 200 meters, but it took us nearly an hour to reach the Big Drop rappel. After carefully surveying the drop, it was decided we would probably not be able to climb back out at this spot. 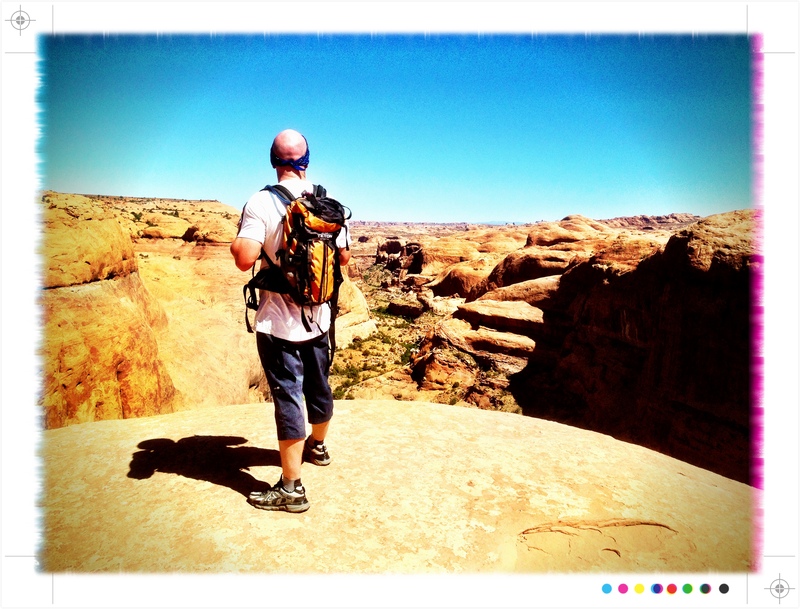 Meaning we would have to hike the reverse of Horseshoe Canyon. Which would have been an amazing hike, with the Great Gallery Pictographs and all. But our vehicle was a good 15 miles back down the dirt road after we finished the hike. That would be almost another 20 miles to hike in the heat if we weren’t able to ascend out of Horseshoe. So we chose not to do the rappel, saving it for next years trip with a larger group and shuttle cars. Or maybe I’ll go the Ralston route, now that I know where it is… Minus the whole cutting off my arm thing. All in all, it took us about 5-6 hours there and back. We packed up camp and headed towards Moab. We had plans to bike Moab’s infamous Slickrock trail. Unaware it was a difficulty level of 5 on a 1-5 scale rating. And Jeremy had never MTB’d before. We decided to just ride around the practice loop. Which is just as hard as the main trail, but only 2 miles long. There were few wipe outs, including Jeremy full on endoing helmet to the rock. And somehow he managed to do a half backflip landing directly on his back. Great first outing for him… By the end we were both getting a hang of riding the ups and downs of the slickrock. Learning when to brake and when to excel. Jeremy was talking of buying an MTB by the end of it. 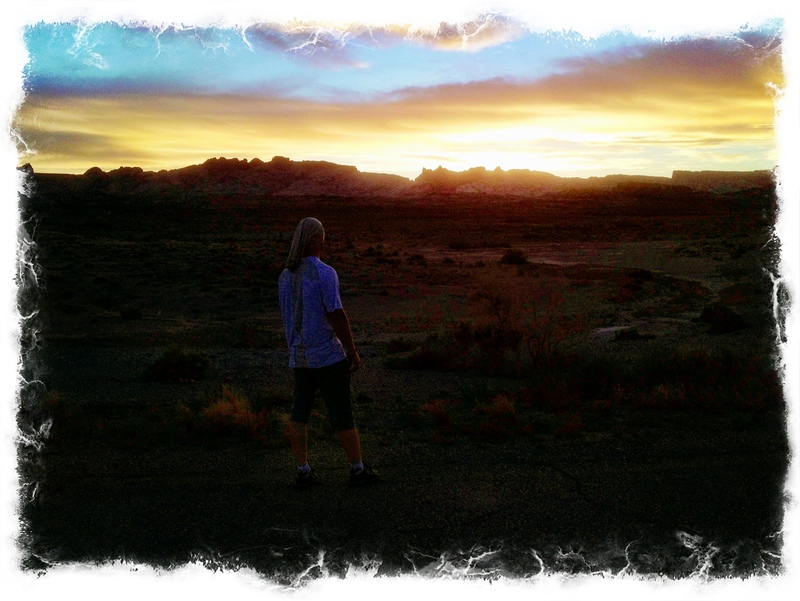 And honestly, I’m thinking of moving to Moab… As soon as feasibly possible.